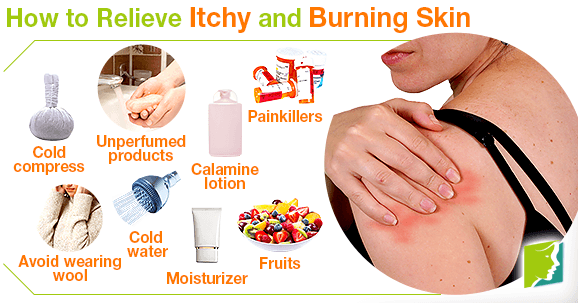 Itchy and burning skin can be painful, distressing, and sometimes concerning, not least because there are so many different reasons, some more serious than others. Sometimes, further damage can be caused due to the often overwhelming temptation to scratch the affected areas, and this can exacerbate the issue. Therefore, it is wise to try and relieve and itchy and burning skin. Read on to find out how you can do this. The pain can be dealt with through the use of over the counter painkillers or anti-inflammatories. However, if you are using any other medications, check with your doctor to see if this is safe. Use a soothing balm or cream if it is due to an insect bite. Keep a cold compress on the area to cool down the skin. Increase your intake of fruit and vegetables, which could help if the burning is due to nutritional deficiencies. Shower or bathe only in cool water. Avoid overexerting the area - if the burning is due to natural wear and tear or an injury that you might not even know you have, the area might just need to rest for a while, and doing too much could do more harm than good. There are a myriad of factors that can contribute to itchy or burning skin, and finding out the underlying cause in order to deal with the problem at the root should be the first step. However, this remedy will most likely not be immediate, and so implementing some home remedies to relieve the pain can lead to less discomfort and less chance of causing long-term damage by scratching.